Sen. Elizabeth Warren is still metaphorically hemorrhaging from the whole Native American heritage debacle, and it doesn’t look like it’s ever really going to stop producing political fallout for her. Which makes you wonder why in the world she decided to run for president after the results of the DNA test more or less proved she’s not really Native American. 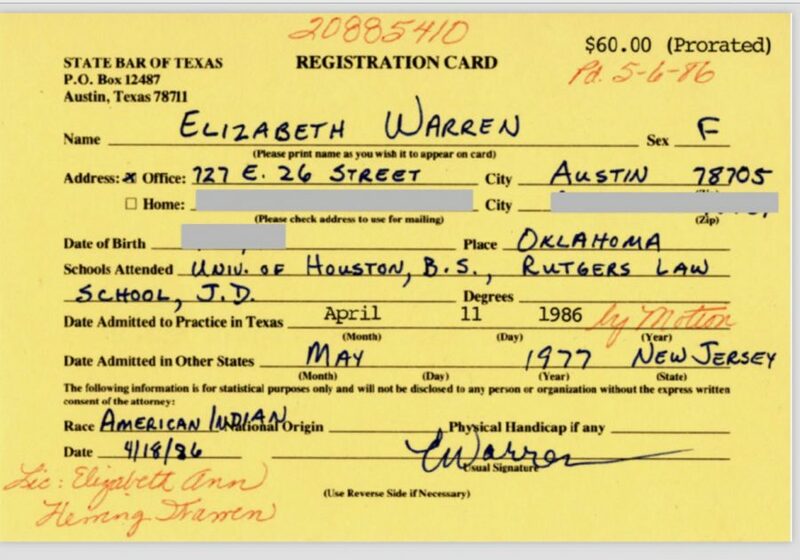 Well, as it turns out, she claimed Native American heritage on her State Bar of Texas registration card back in 1986. “I can’t go back. But I am sorry for furthering confusion on tribal sovereignty and tribal citizenship and harm that resulted,” Warren told The Post. There are many instances that now exist where Warren used her claimed heritage to help her further her career. She listed herself as a minority in the Association of American Law Schools from 1986-1995. Warren also changed her ethnicity to Native American in the University of Pennsylvania records in 1989 as an employee. In other words, she got a lot of help for being a supposed minority, despite the fact she looked white as a sheet, and has almost zero Native American DNA. And yet, there doesn’t seem to be very much outrage from the left. Guess if you’re one of their own you can do what you want and get away with it.